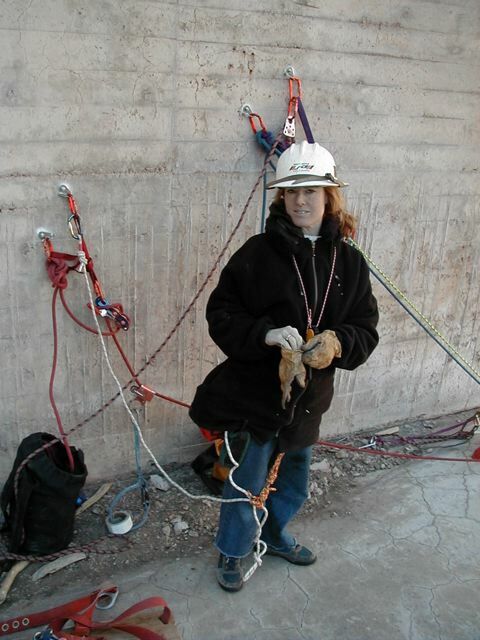 Jayne Thorne is the president of Ropes That Rescue Limited in Northern Arizona. She has a number of administrative duties at the company and is recently retired from a long career in nursing (both critical care and radiology). She is now a full time mother for the three children, two of which are still living at home. Jayne has accompanied Reed on several of his training excursions around the USA including the ESMO show for live line maintenance of electrical power transmission lines in Quebec. Accordingly, she is at ease putting on a hard hat and climbing towers along with the other linemen. Today, Jayne enjoys helping daughter, Arianna, prepare for the challenges of championship Irish dancing. 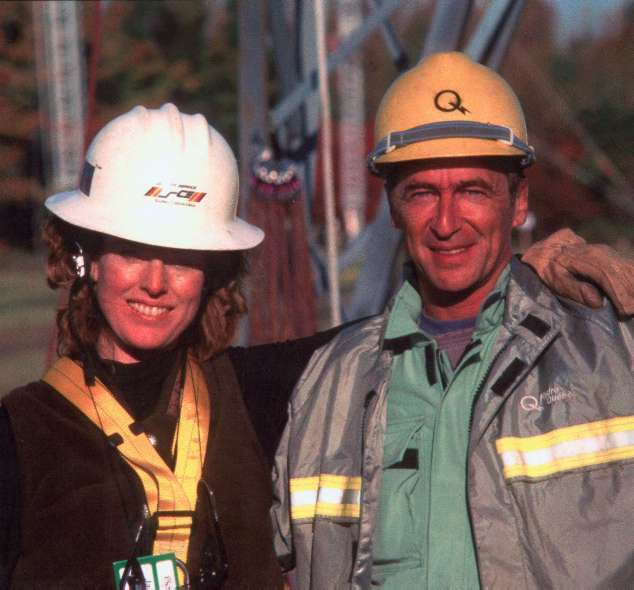 Jayne with Hydro Quebec lineman, Claude LePoint during tower rescue training in 2002. Even though Claude could not speak a word of English, Jayne and he still hit it off during the training. 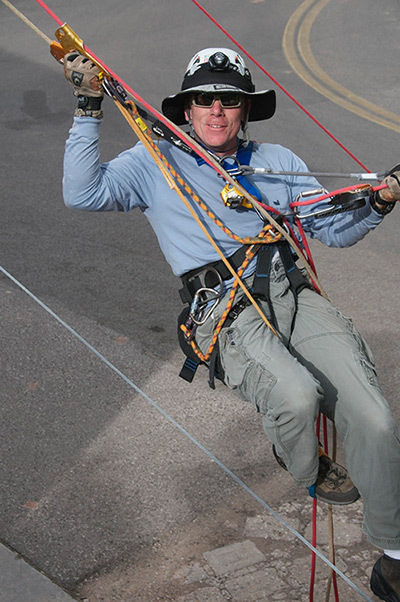 Above: Sedona Red Rock News photo of Reed during the 1989 world record Kootenay Highline (2,234') from Teapot Rock with Arnor Larson of RIGGING FOR RESCUE. 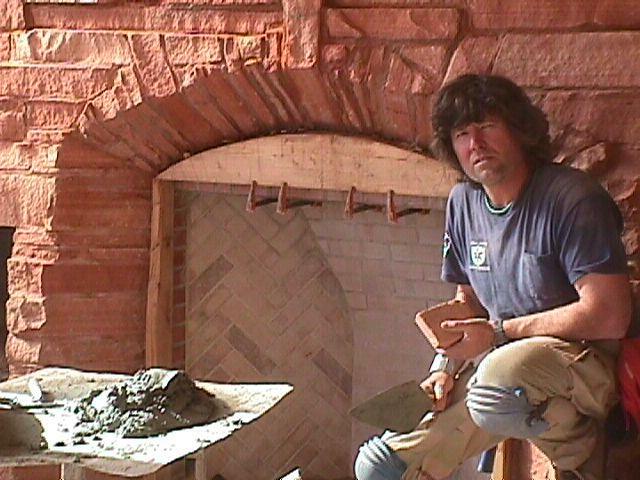 Reed Thorne has been involved in the teaching of techniques relative to the 'vertical realm' since the early 1970's. 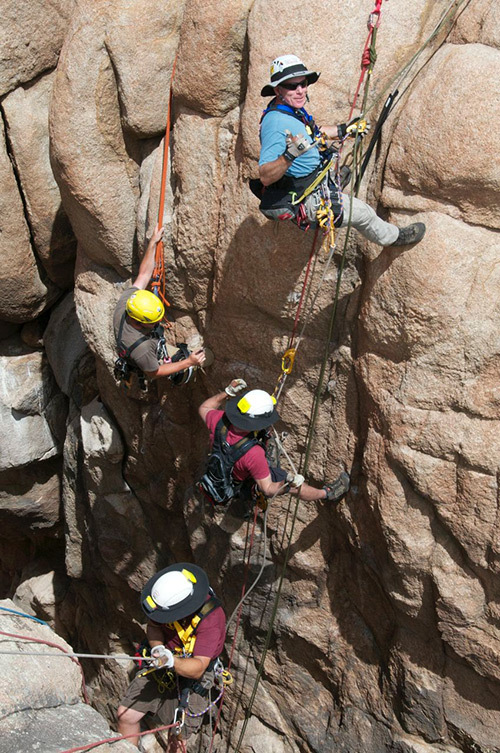 In Southern California, his first activities dealing with rope were with the Sierra Club Angeles Chapter (Orange County Group) where Reed became a Hundred Peak, Rock Climbing and Mountaineering Section leader through training with the Sierra Club's Leadership Section. He eventually moved into rope rescue instruction under nationally-recognized US National Park SAR ranger, Butch Farabee, at the Grand Canyon in Arizona between the years of 1981 and 1986. Butch is credited with having shaped Reed's early years as a rope instructor. 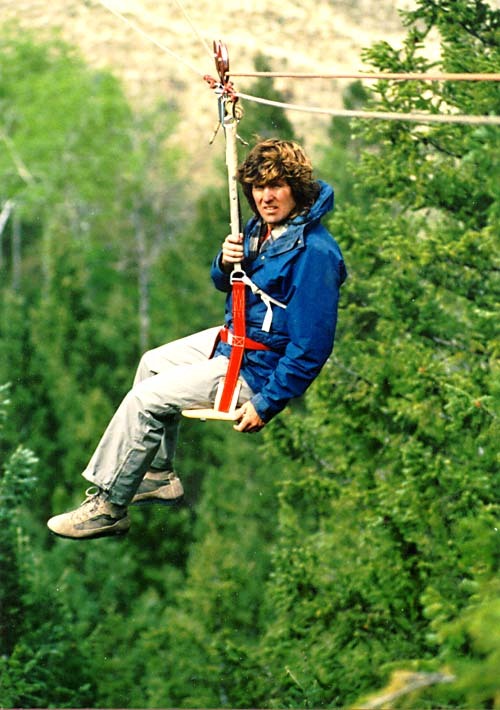 In 1989, Reed was also instrumental in the preliminary testing of belay techniques alongside John Dill ofYosemite SAR and Arnor Larson of theBritish Columbia Council of Technical Rescue in BC, Canada. 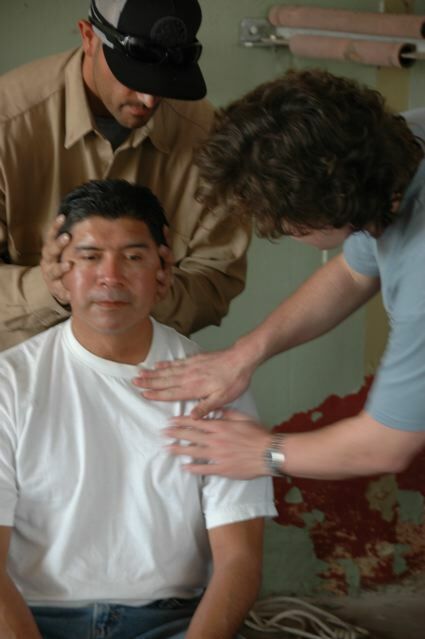 These tests still remain some of the most extensive ever attempted by a volunteer team of lay-researchers, the results of which were published in Response magazine in the highly acclaimed 1990 article "Are You Really On Belay?" by John Dill. Many of Reed's hand-drawn illustrations accompanied this article. Reed now has attained recent Technician Level certification with theSociety of Professional Rope Access Technicians (SPRAT) where he practices rope access procedures often on his back yard training and testing tower. His services have been required on several dams and bridges throughout the Southwest including work onHoover Dam and also in trainingArizona Department of Transportation structural engineers during the construction of Navajo Bridgeover Marble Canyon in 1995. 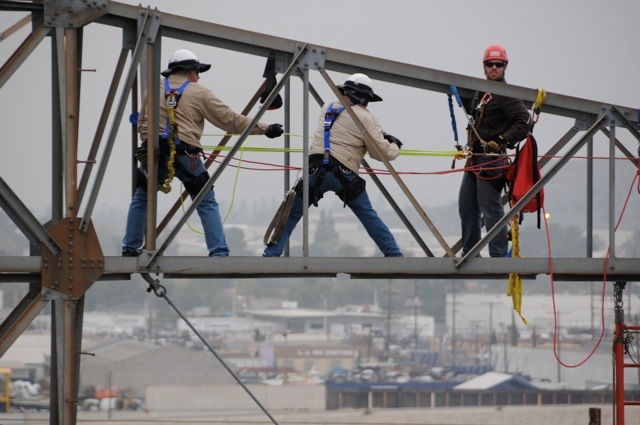 His work with various construction companies such as Edward Kraemer and Sons, Kiewitt Western and Vastco Companyhave earned him a reputation as a knowledgeable technical rigger where understanding and safety are of paramount concern. He formerly was the primary rope discipline instructor for the Arizona State Fire Marshal's Office for over five years before privately forming Ropes That Rescue Ltd. (RTR) in 1993. Since then,RTR has traveled and taught extensive programs to fire/EMS agencies around the world, including Australia where he holds regular programs hosted by Fire & Rescue Australia. Mining and oil refineries from Arizona to northern Canada have contracted rescue programs within the challenging terrains of their own operations. Electric power utilities and others have also used Reed to teach their emergency response teams. 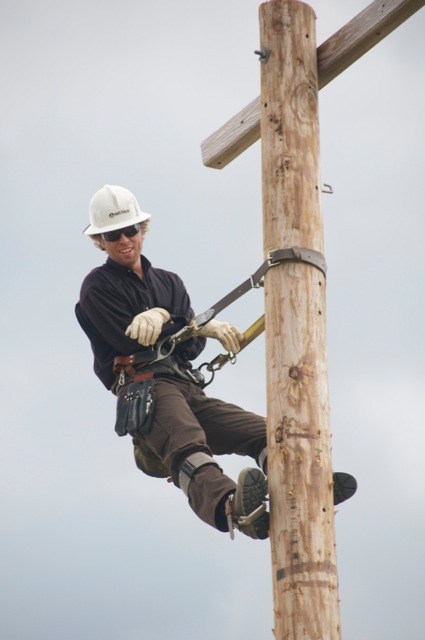 His thorough knowledge of the electric power delivery industry has lead to many of the procedures and techniques he espouses in his rigging courses. 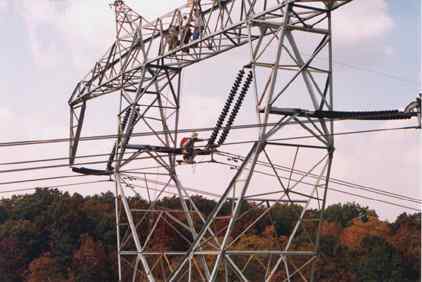 In 2001, Reed's pioneering power line rescue techniques were featured in the History Channel special"High Voltage" (on 'Suicide Missions')delineating extra hazardous rescue procedures with Georgia Power transmission linemen on energized 500,000 volt power lines (left). 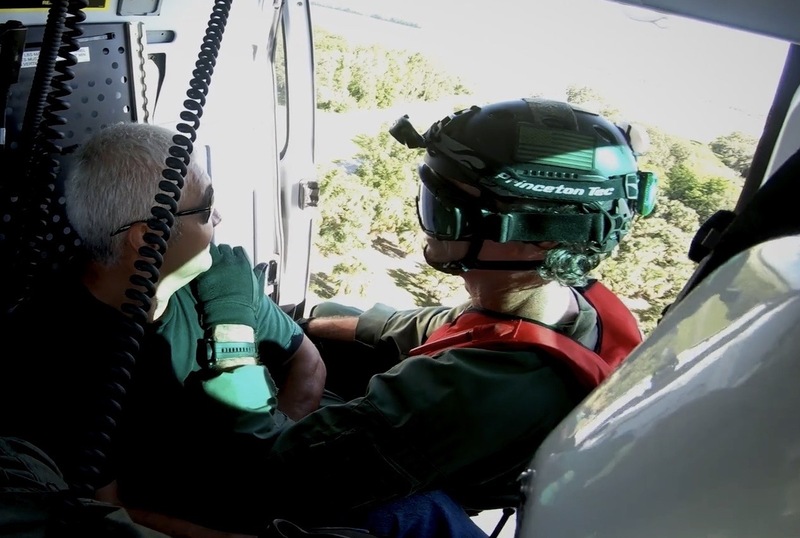 In addition, Reed has recently completed two full-length DVD's on TOWER RESCUE, one for emergency responders and a second specifically for tower workers. These training DVD's are accompanied by full color manuals (right) which Reed authored, photographed and illustrated. rumford.com/Thorne.html. Reed also dabbles in cartooning and other forms of artwork. His cartoons have been featured in Advance Rescue Technology magazine accompanying his article "A Young Person's Guide to Pulley Systems" in 2001 and later in a nine part series "A Young Person's Guide to Structural Rescue" in 2005. Click on the drawing to see the entire stupid cartoon. Hanging out on high voltage power lines is one of Reed's loves in life. 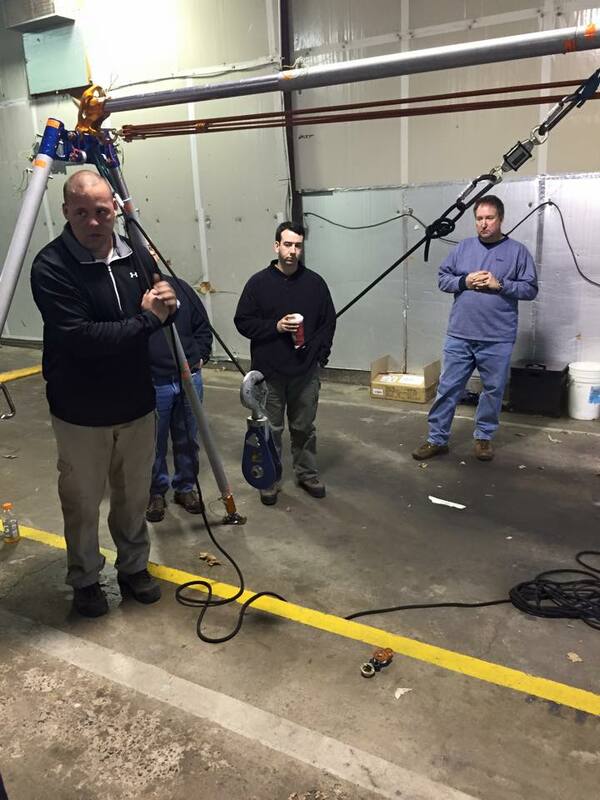 Reed teaches linemen from around the world on tower access and rescue. 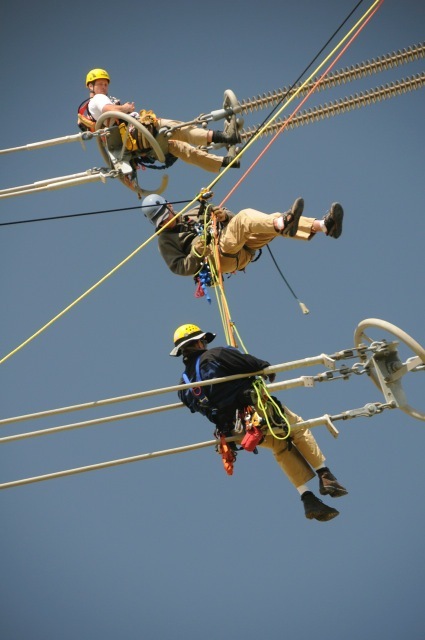 This 2008 photo by Becky Cordova is 200' up on 500,000 volt transmission lines in Sacramento during training for the utility there. 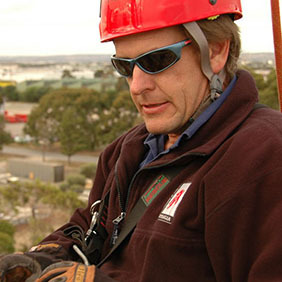 Len Batley during the Structural Tower Rescue Workshop in Adelaide, South Australia in 2008. 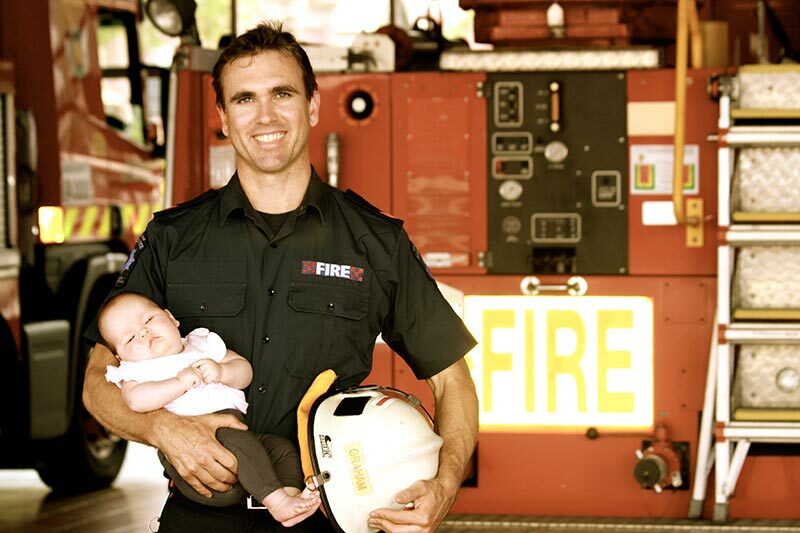 "Ruggedly good looking"
Len Batley is a Fire Officer with the South Australian Metropolitan Fire Service, Australia. 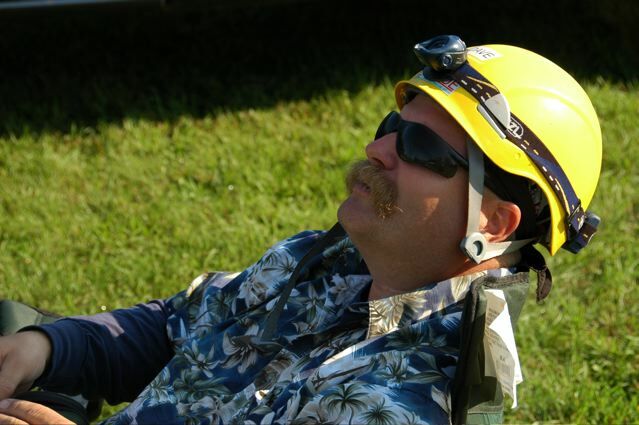 He has over 20 years experience in Emergency Services specializing in Technical Rescue. Len has achieved instructor status with many emergency services Australia wide as well as holding many international qualifications. During his time in the Fire Service he started and coordinated the rope rescue program expanding in to other areas of technical rescue. This involved the initial implementation and training of instructors, and the control of quality standards through all shifts and departments of the Fire Service. In 1998 Len was awarded the prestigious Winston Churchill Memorial Trust Fellowship. This opportunity enabled Len to study technical rescue with emergency organizations in Canada, United States, Sweden, United Kingdom and Singapore for six months. Utilizing his knowledge gained locally and internationally Len has set up a training company (Fire & Rescue Australia). Fire & Rescue Australia specializes in teaching ongoing training to corporations, emergency services members and individuals. 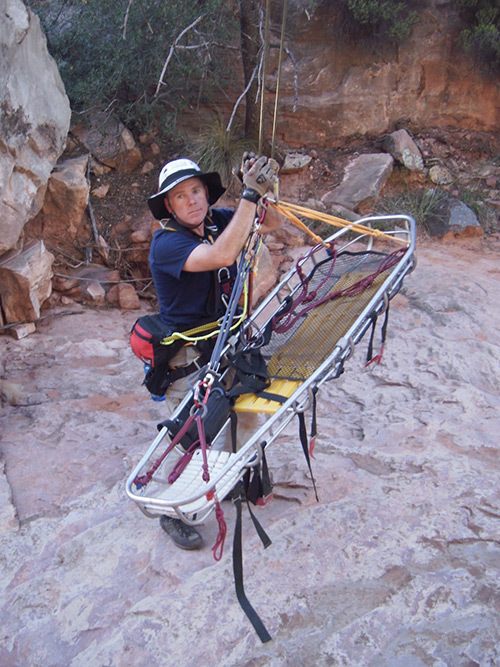 Participants frequently describe Len's courses as "the most intensive, enjoyable learning experience in Australia for rescuers". Len is privileged to be working with Ropes that Rescue and hopes he may be able learn from Reed and other members and to share his knowledge with rescuers all over the world. 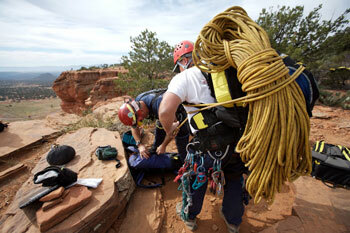 Kevin practicing some rope access skills in Sedona, AZ. Kevin always has his RTR coffee cup with him full of freshly brewed coffee! 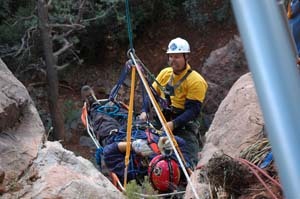 Kevin P. Frye, is a Engineer / Rescue Specialist with the County of Los Angeles Fire Department. 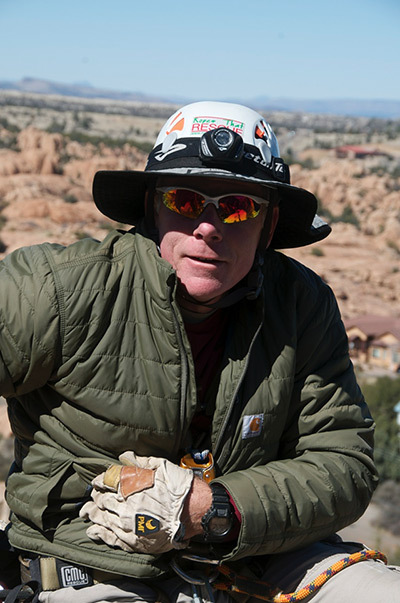 He first experienced the allure of climbing and the outdoors at Joshua Tree National Park in California at the age of 7, and began attending rope rescue classes in his early teens. He has been playing on rope ever since. 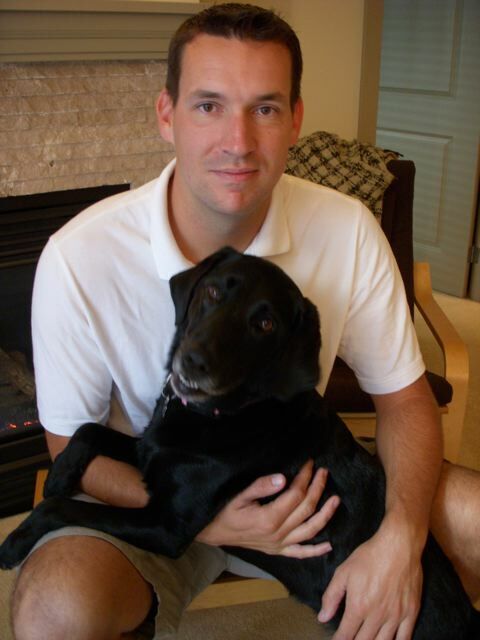 Kevinâ€™s first teaching job was as a weapons instructor in the United States Marine Corps at Quantico, Virginia in 1990. He then moved into the fire service as a volunteer fireman. 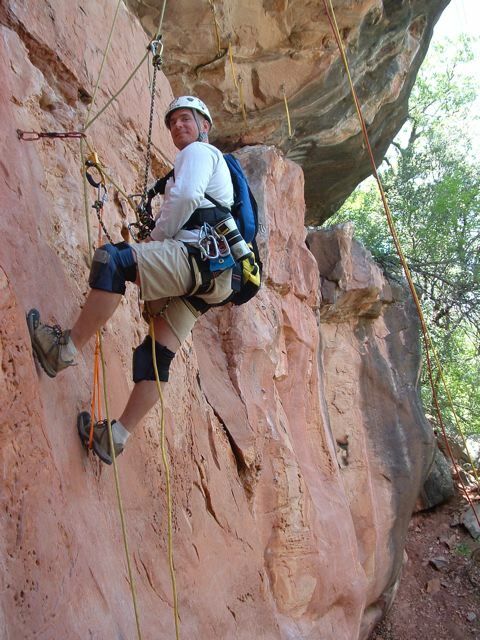 Introduced to technical rescue, Kevin found a way to turn his passion for rope into part of his profession. After being honorably discharged from the Marine Corps in 1993, he went to work full time for Prince William Co. Dept of Fire and Rescue in Virginia. Continuing his fire service education, he attended many fire and technical rescue courses and obtained an Associate Instructor certificate from the Virginia Dept. of Fire Programs. Kevin instructed as an apprentice in many fire and rope classes for PWC and the State of Virginia. He returned to his native California in late 1996, serving as a Deputy Sheriff with the Orange County Sheriffâ€™s Department where he worked as a corrections Deputy for 1 year until the County of Los Angeles Fire Department hired him in 1998. 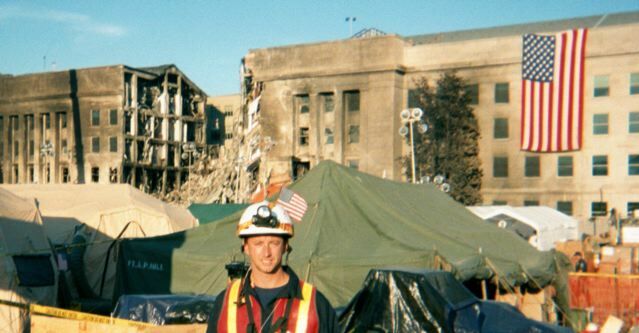 In Feb 2000, Kevin was assigned to USAR 103, one of 2 Technical Rescue units in L.A. County. He is also a Technical Search Specialist on CATF-2, a USAR team with domestic (Dept of Homeland Security/ FEMA) and international (USAID/OFDA) capabilities. Kevin has been a rope and confined space instructor for the Dept. for 4 years. He is also a lead instructor for L.A. County Fire Deptâ€™s R.I.T./ firefighter survival program, which he developed along with Captain Wayne Ibers. Kevin enjoys working and learning in the vertical realm. â€œThe best part about teaching is that I always learn some cool technique from a student!â€ he says. With 2 young sons, being a dad is the best part of life! Kevin climbs when he can and also SCUBA dives off the Ca. Coast. He lives with his wife, Shannon, and sons, Connor and Kaelen, in Carlsbad. Mike Green is a Captain with the Montgomery County (Maryland) Fire and Rescue Department where he is currently the Station Commander of Station 3. He is also a member of Maryland Task Force 1, a FEMA US&R Team, where he serves as a Rescue Squad Leader. Although involved with many disciplines of technical rescue, Mike enjoys technical rope rescue the most. He has taught thousands of hours of technical rescue courses for his own department, the Maryland Fire and Rescue Institute, and FEMA US&R program. Prior to becoming an official instructor for RTR, he acted as an assistant to Reed in a number of his programs. 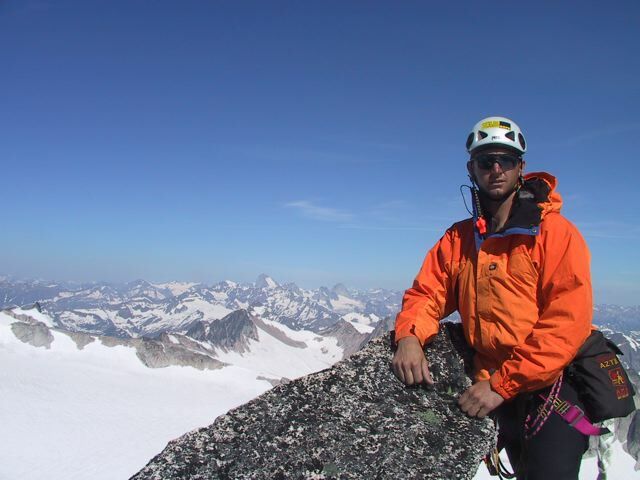 He credits his success in rope rescue to Reed Thorne and Kirk Mauthner (of RIGGING FOR RESCUE of British Columbia), both of whom he has studied extensively with for almost 15 years. Mike has an associates degree in Engineering. 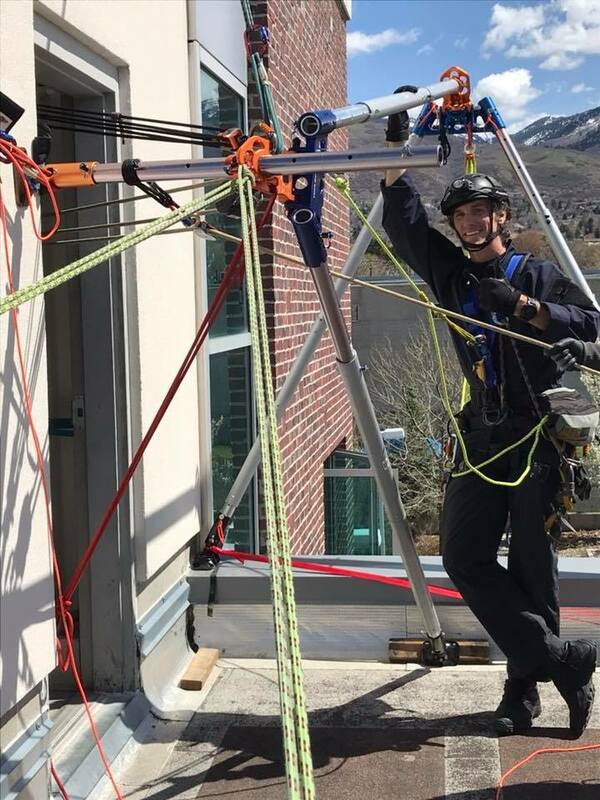 Physics and mathematics play a crucial role in all aspects of technical rescue, and he enjoys applying these principles to a wide range of technical rescue scenarios and problems. He especially enjoys the rare opportunity to elevate the bar and teach technical rescue at a truly advanced level. Another interest of Mike's is research and testing of technical rescue equipment and systems. Like physics and math, testing is also a critical component of technical rescue. In his spare time, Mike spends considerable time on the golf course and driving range. He lives near Frederick, Maryland with his wife Sharyn, girls Courtney and Lindsey, and cat Max. Mike climbing Mt. 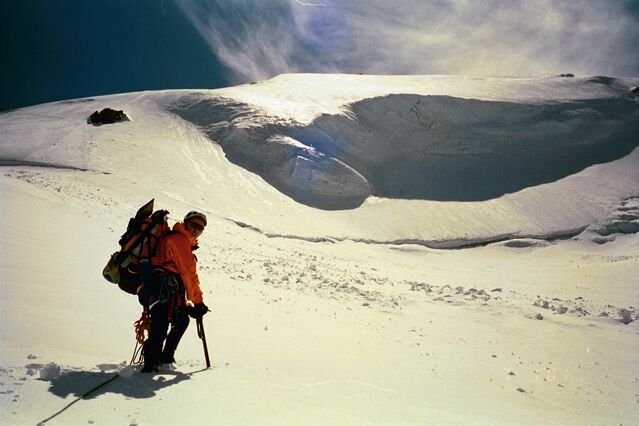 Athabasca BC and, below, on North Star Peak BC during RIGGING FOR RESCUE course with Kirk Mauthner 2003. Notice the AZTEK kit on Mike's side! Eric entered the vertical world during high school in 1977, learning rock climbing on the sandstone cliffs of Southern Illinois. Since then, climbing has been a constant. 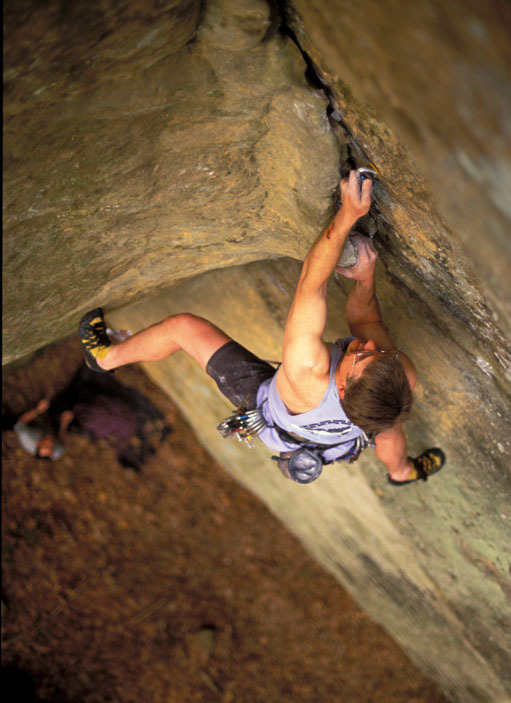 He has opened over 150 new climbing routes in Southern Illinois, and has climbed in areas across the United States. In 1981, Eric concurrently began a 12-year tenure as a Tae Kwon Do and Hapkido instructor at Southern Illinois and Southeast Missouri State Universities, and at private schools. He feels that he draws upon this foundation of precision-coordination teaching when teaching anything, especially the technical aspects of both rigging and climbing movement. 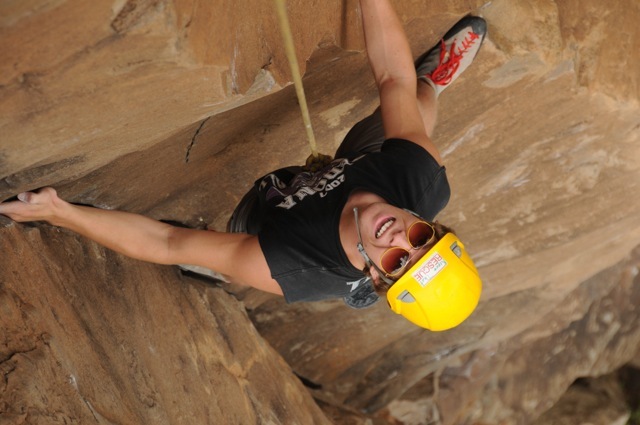 Â Since 1993, Eric and his wife, Kathy, have owned and operated the Vertical Heartland Climbing School. 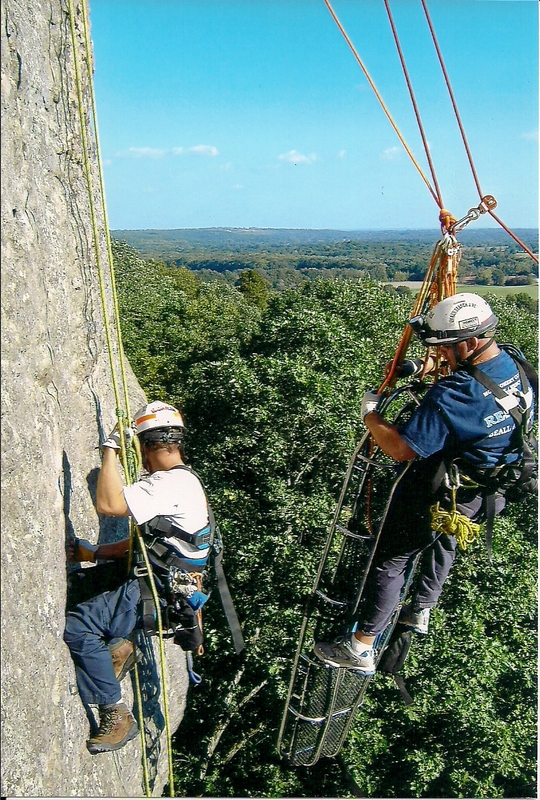 In 1996, they purchased about ¼ mile of the 110-foot high south face of Draper's Bluff in Southern Illinois, built their home at the base, and have since operated the climbing school on site. In the mid-1990s, Eric received training up through advanced rock guide with the American Mountain Guide Association, focusing heavily on multi-pitch guiding and minimalist rescue scenarios. 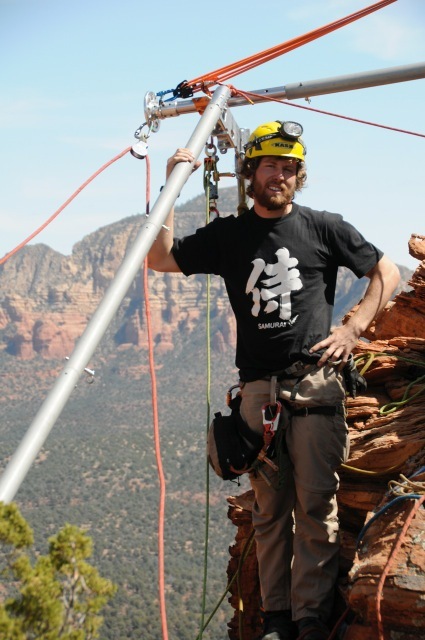 Eric joined the Ropes That Rescue staff in 2005, after training with Reed Thorne since 2002. If not teaching for Reed, Eric can otherwise be found doing complex rigging for sectional trimming and removal of trees leaning over homes with his business, Rope Science Tree Service . A sampling of Eric's other work includes: changing ot 500-pound Hilton Hotel signs via rope access 380 feet above the streets of Springfield, IL; teaching rope skills to Team Columbia Sportswear (EcoChallenge); rope accessed hi-rise window washing in St. Louis; and rigging for a Rescue 911 television show. 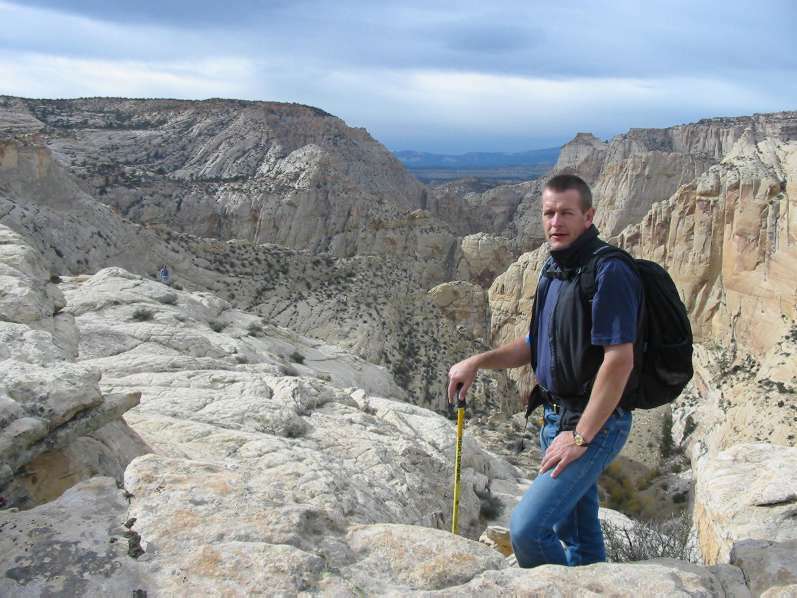 He is the author of three editions of Vertical Heartland: A Rock Climber's Guide to Southern Illinois, having finished the latest in early 2005. He is a licensed Emergency Medical Technician- Intermediate level- with 13 years of ambulance experience at Jackson County, Illinois. 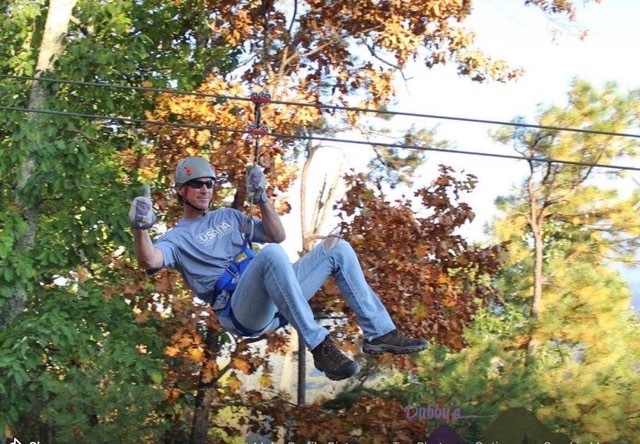 Despite swapping full-time ambulance work for his tree service, Eric remains on the ambulance employee roster to lead the Jackson County Rope Rescue Team in regular trainings and the occasional real call. 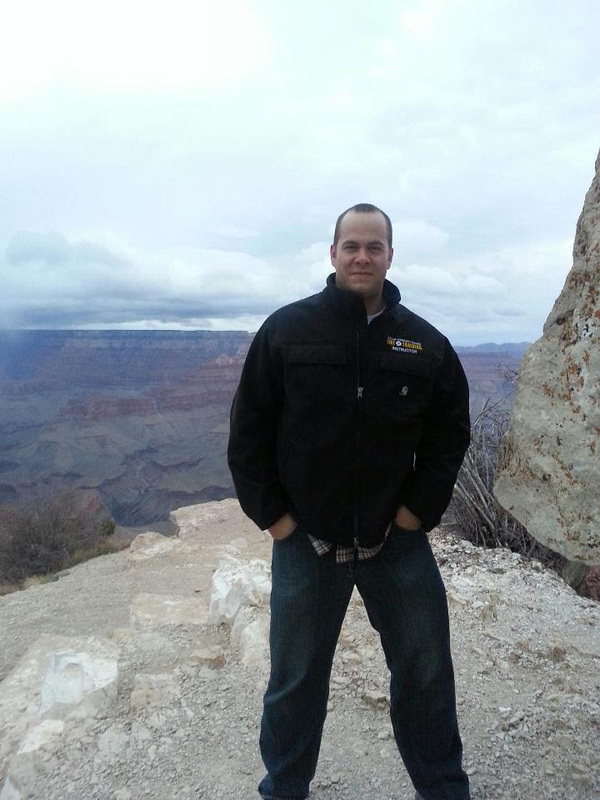 Eric holds a Bachelor of Science degree in-Recreation from Southern Illinois University at Carbondale. 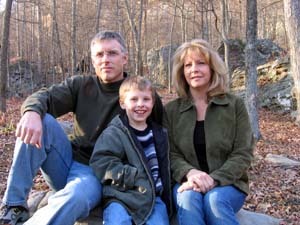 Away from work, he enjoys rock climbing with Kathy and their son, Lukas, and his other passions of martial arts and in-line skating. Dave Van Holstyn (nickname: VH1) is a career Lieutenant and Technical Rescue Coordinator with the Grand Rapids (MI) Fire Department, currently assigned to Rescue Engine Co. #5, one of the departments technical rescue companies. He is a lifelong resident of Grand Rapids and began his fire service career in 1987 as a paid-on-call firefighter in Walker. Dave Van Holstyn, also affectionately called "VH1"
"I think what attracted me to the fire service was the challenge of being called to the worst of situations with the expectation that we will solve the problem. And we do. We have to. There isn't anyone else". Technical rescue incidents present some of the most challenging of those incidents. 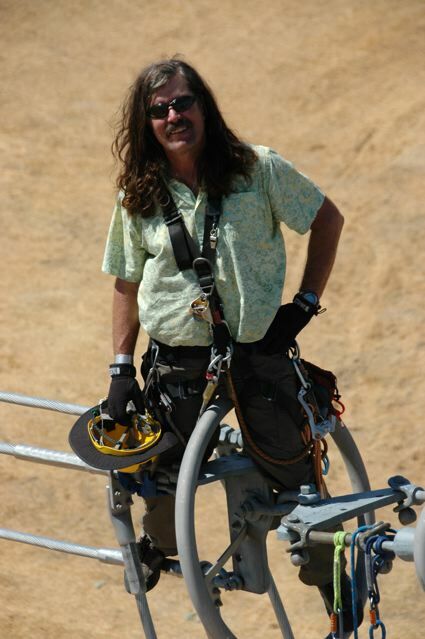 Dave began his formal technical rescue training in 1993 as a charter member of the GRFD confined space rescue team, but his exposure to working at heights started in high school while doing work on communications towers. 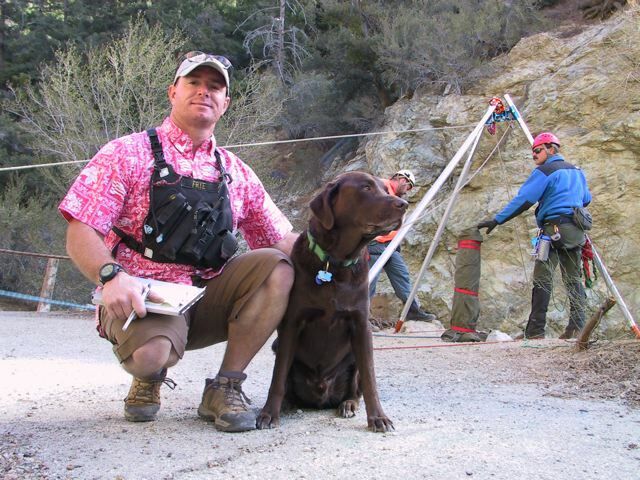 Dave is a team leader for the West Michigan Regional Collapse Rescue Team and as a state certified instructor is active in teaching structural collapse rescue, however rope rescue remains his specialty. He has conducted countless classes, not only for fire departments in Michigan, but also for industrial rescuers in a dozen states and Canada. Dave has made several presentations at the Fire Department Instructors Conference in Indianapolis and is also one of their Hands-On Instructors. Dave was involved in the development of programs on firefighter survival, rapid intervention teams, and most recently industrial extrication. The best memories of his career are intertwined with his worst. The best revolve around the opportunity to not only meet, work, and train with but to also become friends with the best firefighters in the country. These were men who not only understood the mission of the fire service and did it well, but who also exhibited the traits of a leader; humility, compassion and a genuine desire to help others. Tragically several of them were killed on 9/11/01. "I'll never forget Lt. Peter Martin, FF John Vigiano, his brother, NYPD Detective Joseph Vigiano and the nearly 400 others who died because they understood the mission and didn't back away." Dave's wife of 27 years is Joanne, a special education teacher. 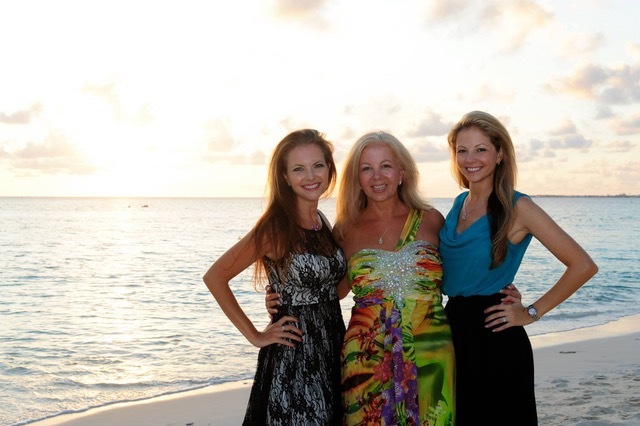 They have three children, Mark, Beth and Renee. Dave and Joanne both enjoy music by Mercy Me, Casting Crowns and Aaron Shust. As time allows they like to ride the bikes trails in Michigan and enjoy taking day hikes, then relaxing around the campfire. "The thing I really enjoy about being associated with RTR is the opportunity to get outside the cookie cutter mentality that surrounds rope rescue in the fire service. The challenges of doing more with less (both people and equipment), the problem solving required combined with the opportunity to work in some of the most unique venues in the country is awesome. On top of all that, you get to meet and work with some of the best rope rescue people in the country....definitely the cream of the crop!" VH1 during the Structural Tower Rescue Workshop in Michigan n 2008. VH1 attands a ltter in his fire department's training in 2002. Jason Masters is a Captain with the Montgomery County Fire and Rescue Service located just outside of our Nation’s Capital. Jason has just over 21 years of combined career and volunteer fire and rescue experience; much of which has been spent in the field of technical rescue. He currently serves as the Assistant Rescue Manager for Maryland Taskforce 1 as well as the training coordinator for the Montgomery County Technical Rescue Team. 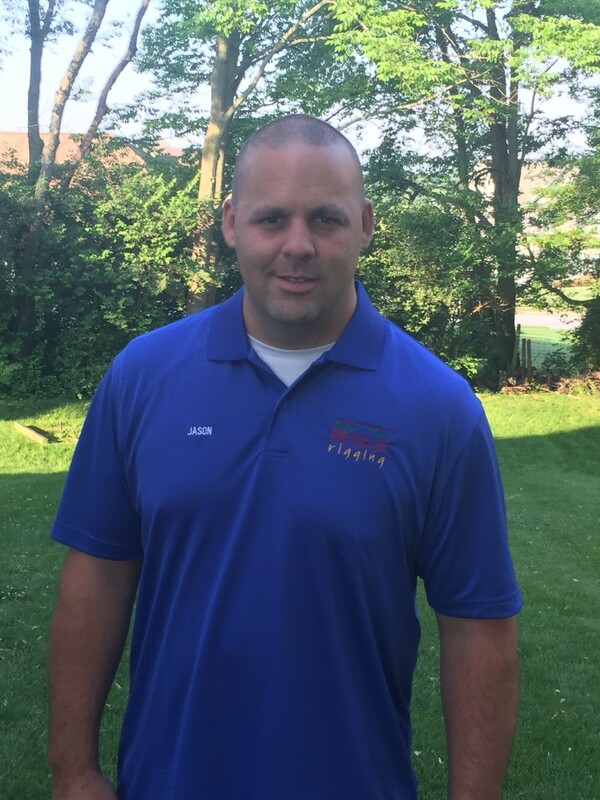 Jason is a certified instructor for all technical rescue courses with the Maryland Fire and Rescue Institute. Additionally, he is a certified FEMA Structural Collapse Technician Instructor and also teaches for Mid-Atlantic Technical Rescue, LLC. 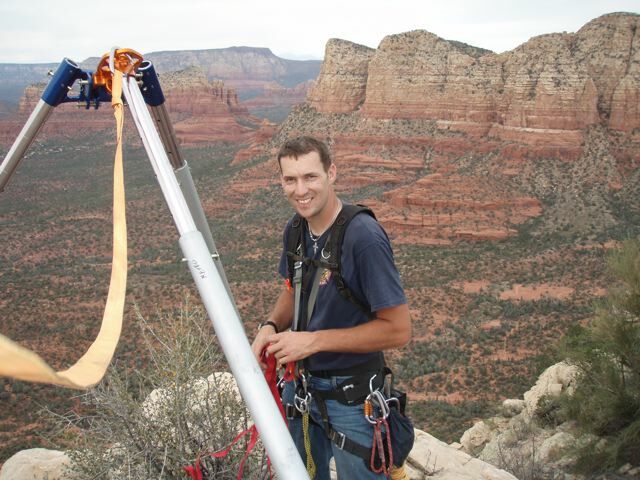 Jason began taking RTR courses in 2006 and has had the opportunity to learn from, and work side by side with what he believes to be some of the best in the technical rescue business. He has a passion for teaching others which is driven by his desire to pass on the knowledge and experiences he has obtained over the years. Jason believes that teaching forces you to know more about a given subject than what you intend to deliver to the students and as such, he continues to expand his knowledge as much as possible. 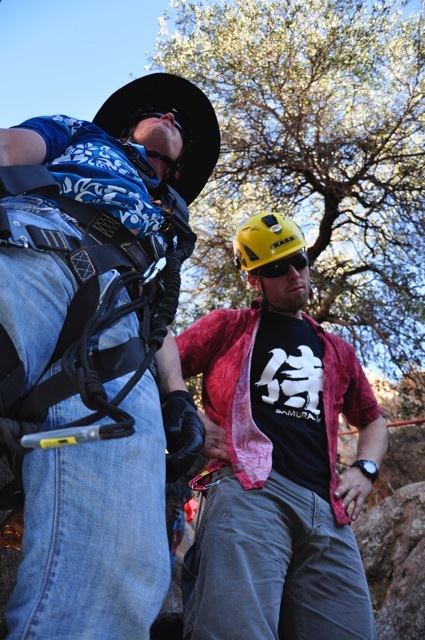 He specifically feels that technical rescue instruction really allows you the opportunity to challenge the student and force them to apply critical thinking in order to accomplish a task. Aside from the Fire and Rescue Service and his teaching commitments, Jason also owns a home inspection business. Jason always looks forward to his family time and the many camping trips he takes each year with his family. 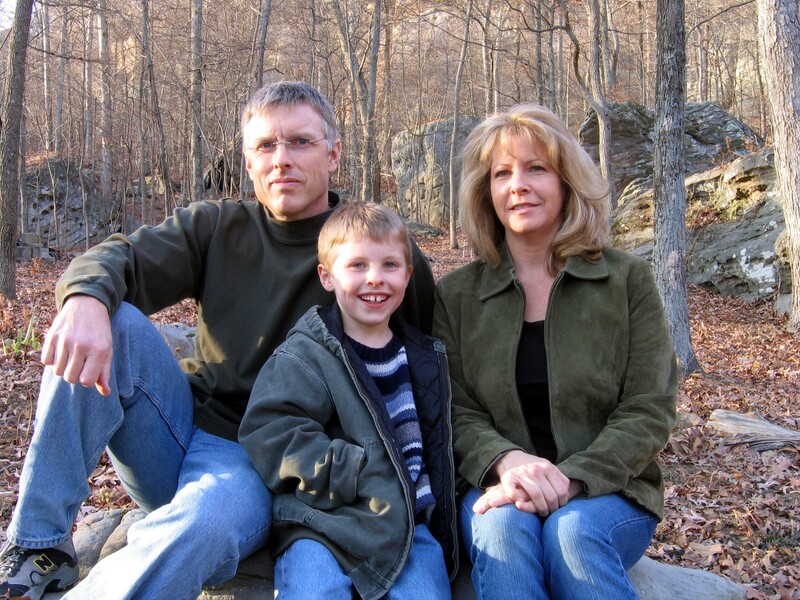 He lives in Westminster, Maryland with his wife, Tonya, and their three children, Bria, Brayden and Kendall. Jason Masters rolling on the rope. Jason Masters taking food items. Greg Powell is a career Fire Captain/Paramedic with the Sacramento Fire Department where he is currently assigned to Rescue 20, the department's only technical rescue company. Rescue 20 specializes in swiftwater rescue, high and low angle rope rescue, trench rescue, confined space rescue, and heavy object lifting and breaching. He has been in the fire service for over 21 years. Greg started his fire service career in 1986 with the California Department of Forestry. 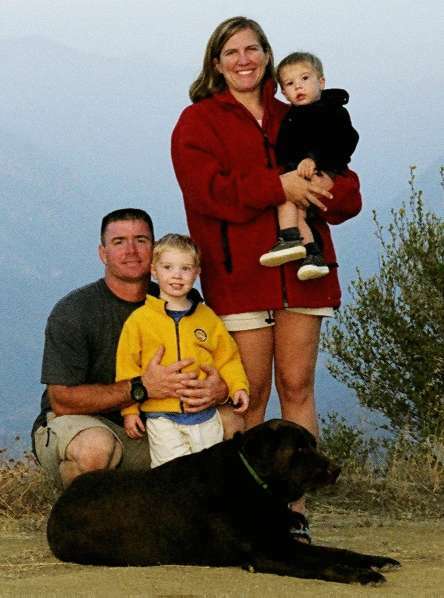 He then left Cal Fire as an Engineer and took a job with his current department, Sacramento Fire Department. During his time with Sacramento Fire he has become a Haz Mat Specialist/Instructor, SPRAT (Society of Professional Rope Access Technicians) rope access certified, Swiftwater Technician/Instructor, Swiftwater Boat Operator/Instructor, Rope Technician instructor, and a Haz Mat EOD consultant. He is a member of FEMA’s CA-TF-7 USAR team and has held positions in rescue, medical, safety, and is currently one of three Haz Mat Team Leaders. 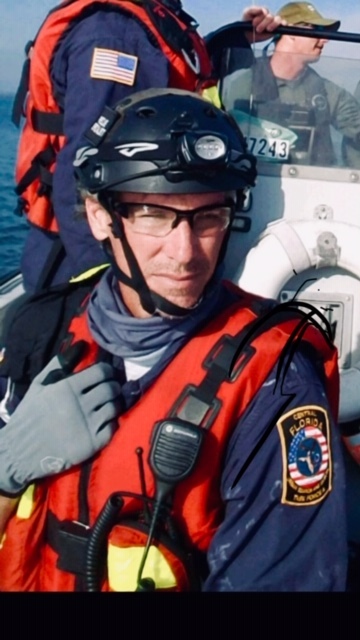 Greg has been deployed to several FEMA USAR incidents with CA-TF-7 and Cal EMA Swiftwater Boat incidents with Cal EMA Swiftwater/Flood Boat Team 7. Called the "Powellnernator" by his friends, Powell spends much of his free time with his wife, Michelle, whitewater rafting. Michelle is a professional river guide and spends her summers on the water. 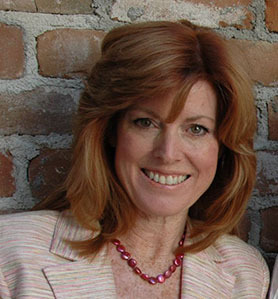 She has traveled across the United States and to New Zealand. 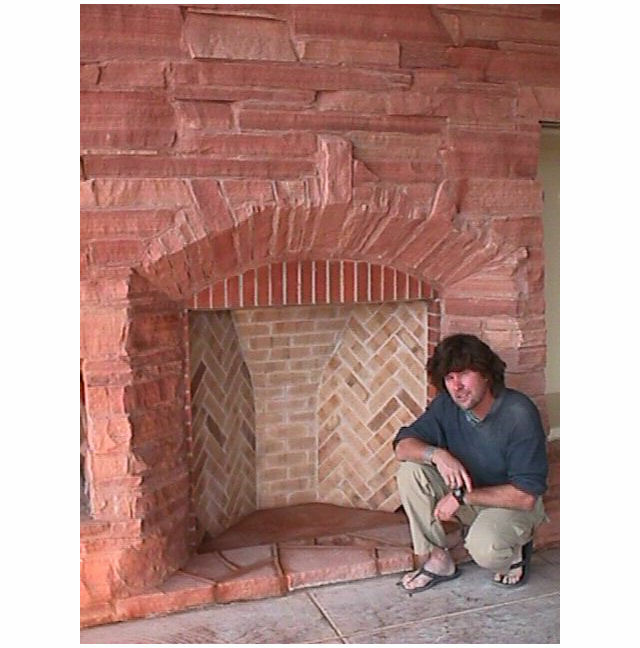 Greg, if not rafting or teaching, spends some of his free time climbing, restoring old muscle cars, and his greatest passion is working on airplanes and crewing for a race plane at the Reno Air Races every year. Greg was present during the tragedy at the Reno Air Races in 2011 and was first on the scene to aid with the mayhem that ensued. Gregory is a caffeine dependent introvert who daily realizes he’s not actually as good as he once thought he was. A fireman from Seattle he plies his craft assigned to Rescue 1 (Ladder 7) and has taught with RTR for a number of years. After completing Jedi training, he and his family moved to an undisclosed location where he enjoys teaching the next generation outstanding knotcraft and how to cook a proper steak (well done to burnt with ketchup). He is a member in good standing of the NRA, AAA and Costco. 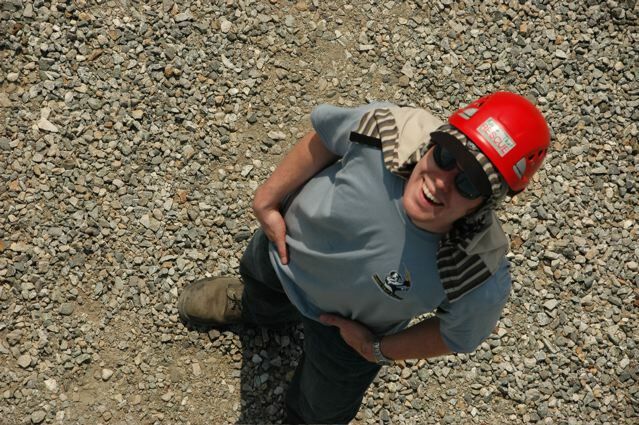 Greg attends a litter on the 750' high Forest Hill Bridge, America's 3rd highest, in a Team Skills Rescue Workshop in 2006. 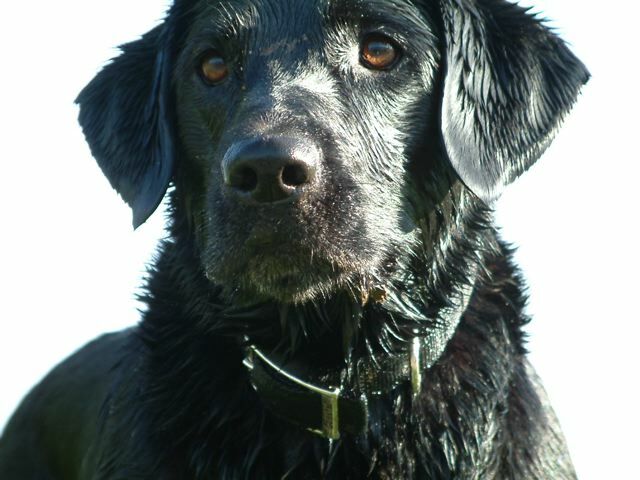 Clara looking rather intent on retrieving a ball! Luke Thorne in 2008 at age 22. Luke Thorne (29) is Reed and Jayne's oldest son. He and his wife, Jessica, both reside in Flagstaff, AZ where Luke is attending his second year of engineering studies at Northern Arizona University (NAU). 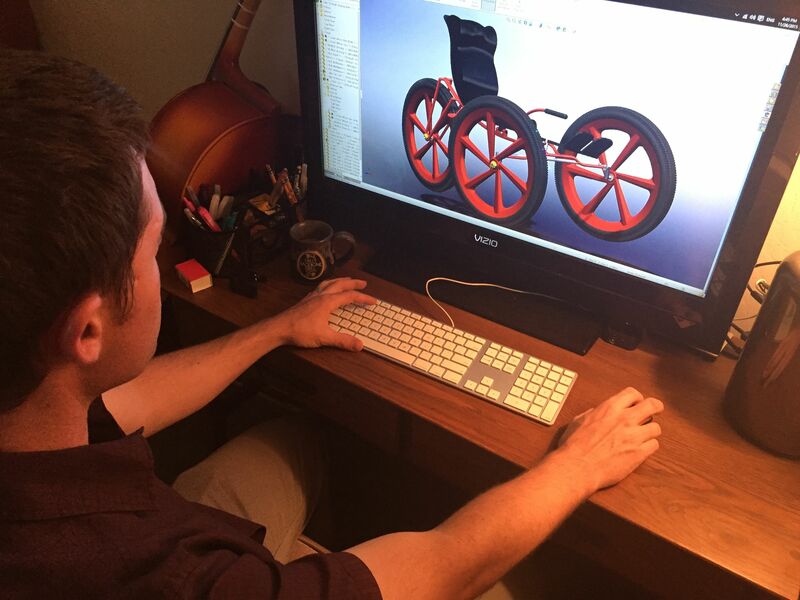 In his classes and in particular his Engineering 180 program at NAU, Luke is using the modelling program, Solidworks® to create products such as those found at Rock Exotica under the Ropes That Rescue imprimatur (The Arizona Vortex, AZORP, AZTEK and more). 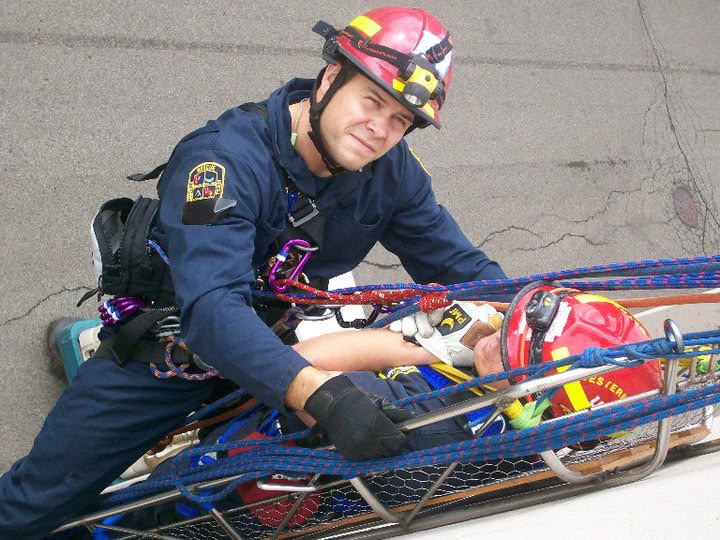 He has many talents and often helps his father, Reed, teach the medical and technical aspects of rope rescue. Luke is the principle instructor for the "Beyond The Barn Floor" 2 day seminar coming up in January, 2016 where he will present advanced physics. The Beyond The Barn Floor Seminar is a take off from the somewhat famous quote of Bible teacher and theologian, Donald Gray Barnhouse (1895 - 1960) "If you are going to be a success (in communicating the Gospel) get the hay down out of the loft, onto the barn floor, where the cows can get it." This quote has been used with limited success by senior instructor, Reed Thorne, in relaying the importance of simple and effective communication regarding physics and other physical laws we are inextricably bound to. In this 2 day program, we leave the barn floor and climb into the "loft" with lessons on physics and trigonometry for those seeking more understanding and depth to their teaching as instructors. Previously, Luke took the Emergency Medical Technician course at the local college, passing the national certification with ease. In 2008 Luke bacame a reserve fire fighter with Rimrock Fire Dept. south of Sedona. 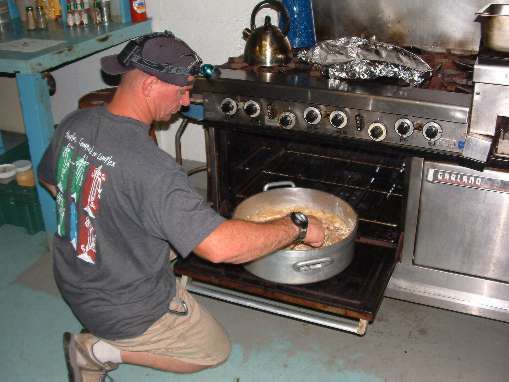 In the summer of 2010 he worked as a wildland fire fighter for Crown King Fire Dept. Luke has also certified as a rope access technician Level 1 with the Society of Professional Rope Access Technicians. Keith Thorne is Reed and Jayne's middle son at 24. He is a regular assistant co-instructor with his father, Reed, and travels extensively around the United States. Keith is a true critical thinker and prides his ability to think outside the box with the students. 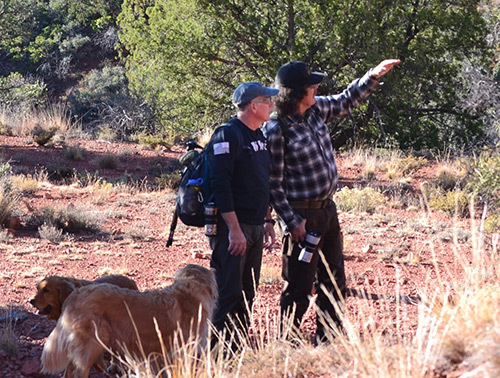 In Prescott, Arizona, Keith is a regular co-instructor along with his brother, Luke. The two boys love teaching rigging at RTR programs and regularly accompany each other in climbing, mountain biking, camping, hiking and anything to do with the backcountry. Keith has taken up the guitar and loves reading as a pastime. 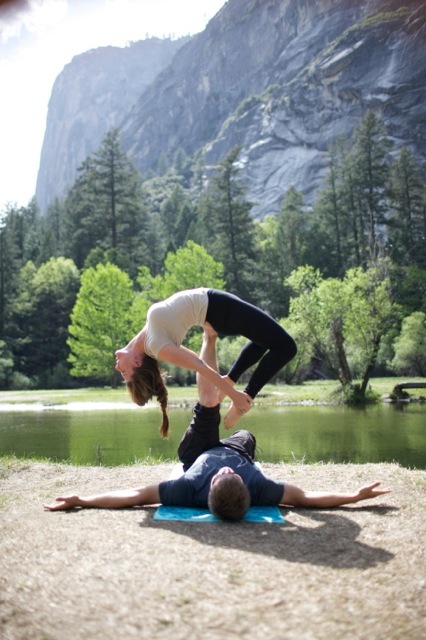 He and sister, Arianna Rose (21), also enjoy acro yoga (acrobatic yoga) whenever they are together. He also loves working out with weights, resistance bands and in a devotee to the P90X regimen. Keith has also certified as a rope access technician Level 2 with the Society of Professional Rope Access Technicians and has worked in Saudi Arabia for Arabian Rope Services. 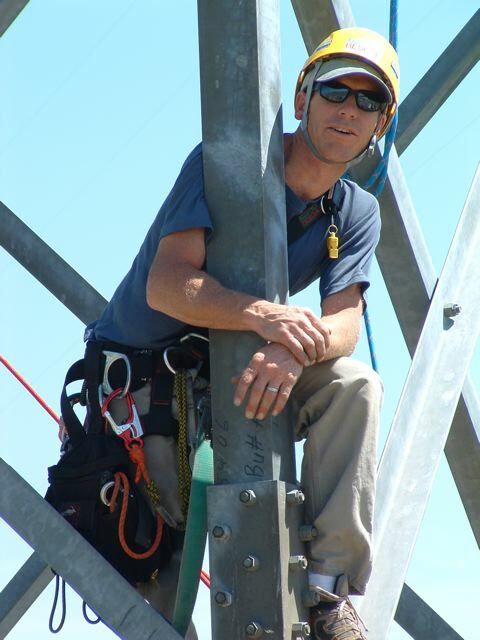 Below, Keith on his very first 40' pole climb at NSTAR Electric Utilities in Plymouth, MA in 2013. NSTAR Linemen who watched him climb that day said Keith was better and more comfortable than linemen they have had on the job for 10 years! 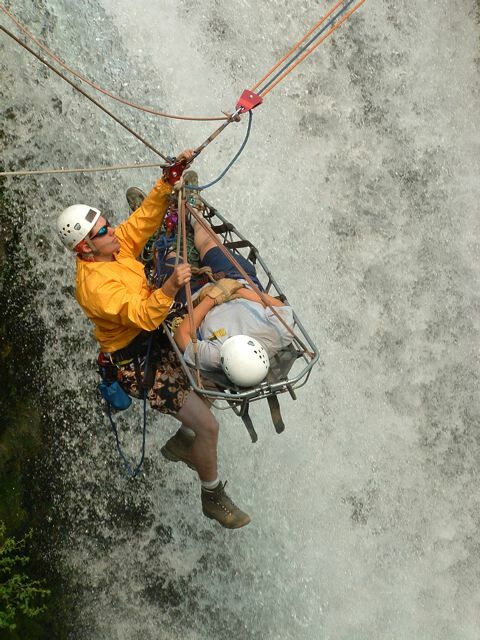 Keith on the top conductor watching students below during OHRW (Offset Highline Rescue Workshop) in California in 2012. Keith and Bonnie, our family golden retriever. Darrell is a Pennsylvania native before migrating to Florida and grew up in an era known for expressing oneself and dubbed the “70s”. He was raised as a very humbled self-confident, ambitious, courageous, athletic, and analytically spirited individual. Darrell enjoys the thrill of embracing challenges and adamantly believes that anything in life that’s worth doing is always worth over doing it! His arduous journeys to seek out the adventurous life of personal growth and development led Darrell to discover the uniquely aspiring professions of public safety. This is where he’s edifying his passion for humanitarianism. For the past 26-plus years, he has been serving as a Lieutenant for the Seminole County Fire Department and has the very distinct privilege to serve in numerous diverse roles within his career that include Professional Development/Training Officer, USAR, and other job related Special Operational duties. In addition, he serves as a Deputy for the Seminole County Sheriff’s Office where he holds an honorable position within the essential constituents of Law Enforcement - Special Operations. In 2005, he met Reed Thorne in Sacramento, California where he was graciously baptized into “The Art of Clean Rigging”. This is where he intensely learned that rope-rescue work isn’t just a routine of repetitive skills being disseminated by commercially designed production books, but rather they’re conversely a true symphony of appreciative compositional art forms that require years of intricate study and mastery to achieve substantial performance. Darrell became so intrigued with the RTR art-forms and its profound validity of teachings that he became totally immersed in his erudite pursuits by purposefully enrolling into more RTR curricula offerings. He has participated in the mastery of Personal Skills Rescue (2009), Team Skills Rescue (2007), Industrial Skills Rescue (2006), Advanced Skills Rescue (2005 & 2008), Artificial High Directional (2018), Rope Access (2010), and Structural Tower Rescue (2005). He still remains vigilant in his desirable “Art of Clean Rigging” mastery development that consistently impel his fervent knowledge for it all! Mike is a Firefighter with the City of St. Clair Shores, a Rescue Squad Officer for both Michigan Task Force 1 and Macomb County Technical Rescue Team. 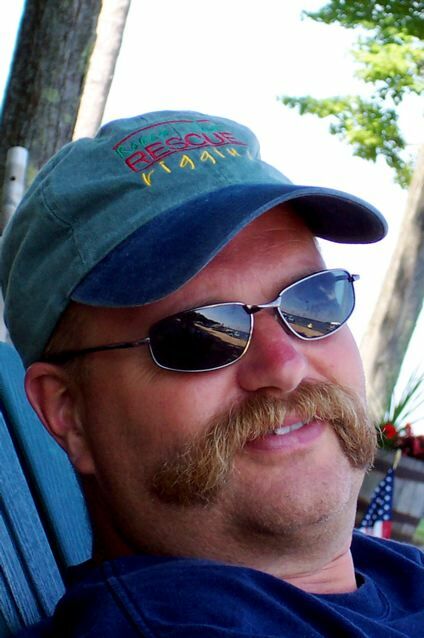 Mike is certified as a fire instructor by the State of Michigan and the Michigan Urban Search And Rescue Training Foundation, holds his SPRAT ticket, and has conducted numerous trainings in multiple fire and rescue disciplines in various states and Canada. Mike's interest in rope, knotcraft, and rigging began at a young age as an angler with his father & brother, who are both career firefighters, on Michigan's Great Lakes. Before entering the fire service with the City of Ann Arbor, Mike worked in the outdoor industry at a gear shop outfitting climbers, mountaineers, backpackers, kayakers, and the occasional arborist with tools and equipment. 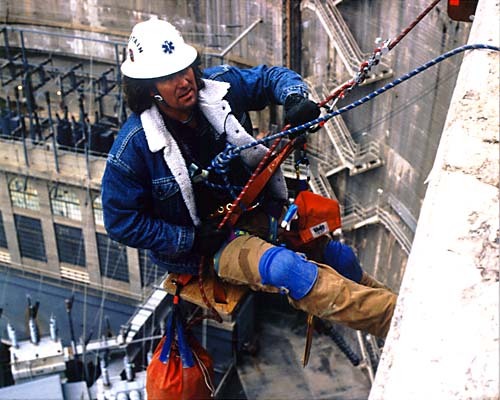 Initially assigned to a Rescue Company with AAFD, he diligently sought out instruction from those with knowledge, skills, and abilities in the technical rescue fields, always enjoying 'on rope' endeavors the most. In 2013, then with SCSFD, Mike began to study with RTR under Chief Reed Thorne when he came to Michigan to teach an AHD workshop. 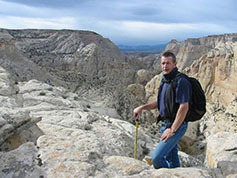 This experience opened his eyes to advanced rigging practices and he began to make regular trips to Arizona for classes. It was in 2016 when RTR asked Mike to come on as an Assistant Instructor. When asked about the RTR paradigm, Mike replied: "The courses are packed with volumes of information intended to take the rope practitioner to a whole new level of skill and understanding. Through advanced knotcraft, thorough critical analysis training, and loads of practical application, students leave the immersive experience being able to problem solve effectively and engineer systems as team leaders in environments they would have never thought possible." 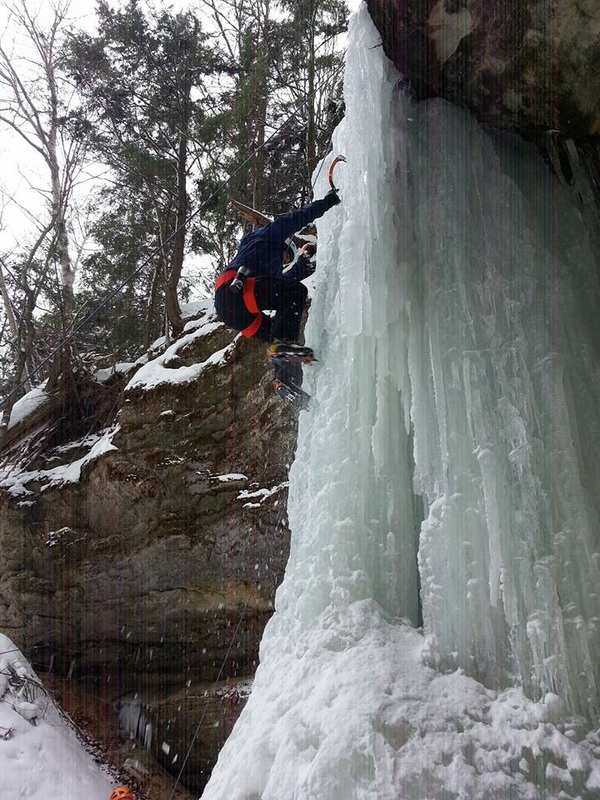 Michael DeCraene climbing ice wall. Michael DeCraene resuing another fire fighter. 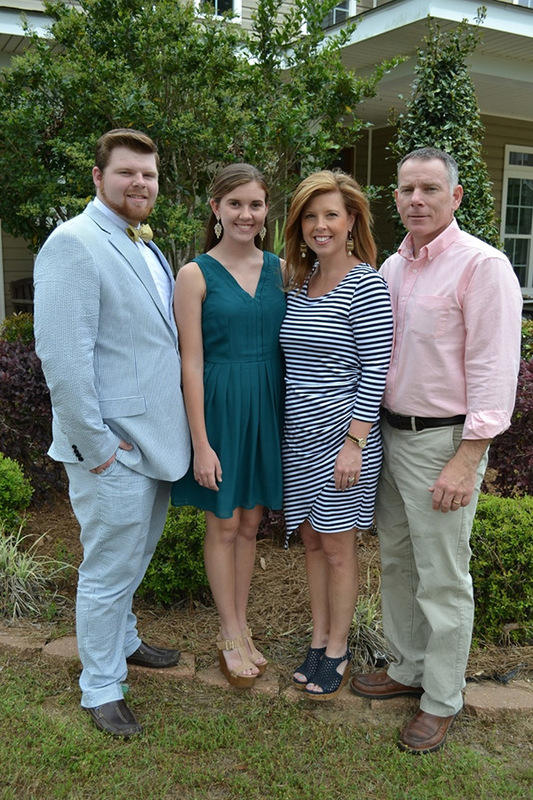 Occupation: Shift Foreman and Emergency Response Coordinator at Tate and Lyle Sucralose INC.
Del lives in Mississippi with his wife Mary, son Ryan and daughter Morgan. He is a shift foreman for an industrial plant near Mobile, Alabama. He also serves as the facility's Emergency Response Coordinator. He is a certified Industrial Emergency Response Specialist and has been a part of emergency response teams for industry since 1997, working as an industrial firefighter, Hazmat Technician, Emergency Medical Responder and Rope Rescue Technician. He holds National Board on Fire Service Professional Qualifications for Confined Space Rescue, Rope Rescue, Trench Rescue, Hazmat Technician, Hazmat Incident Command and Vehicle Extrication, but rescue has always been his real passion. He has worked as an instructor for several rope rescue programs prior to working for RTR, most notably Texas A&M University's Fire school where he worked full time as a rescue instructor for 3 years. 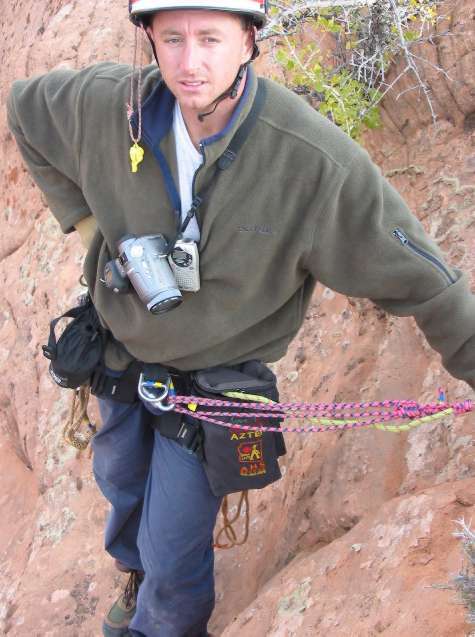 It was there where he reached out to Ropes that Rescue for Professional development training in 2010 on the Arizona Vortex and that has brought him back to RTR for class after class ever year since. 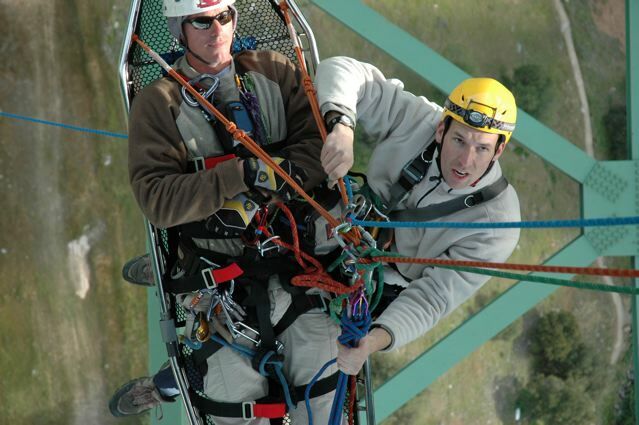 Del is a SPRAT certified rope access technician who's love for anything having to do with rope and rigging spills over from his career to his personal life. 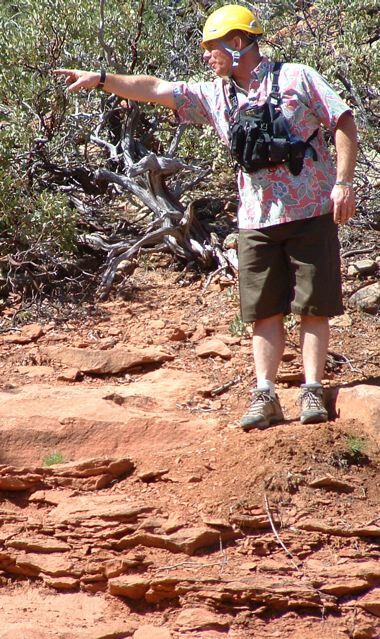 He is an outdoor enthusiast that loves hiking, biking, rock climbing, SCUBA diving, hammock camping, running and triathlons. He loves to teach and says, "there is always more to learn and more people to learn from!" 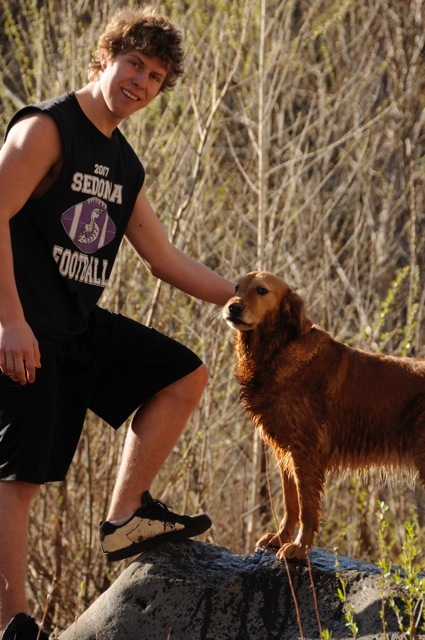 Day Hike with Reed and the Pups! Joel is a Station Officer (Captain) with the South Australian Metropolitan Fire Service (SAMFS), South Australian USAR Task Force and SAMFS Vertical Rescue Instructor and SAMFS Technical Rescue Project Officer. Joel is a Station Officer (Captain) with the South Australian Metropolitan Fire Service (SAMFS), South Australian USAR Task Force and SAMFS Vertical Rescue Instructor and SAMFS Technical Rescue Project Officer. Although an instructor in many Technical Rescue disciplines, his passion and specialisation lies with Rope and Confined Space Rescue. 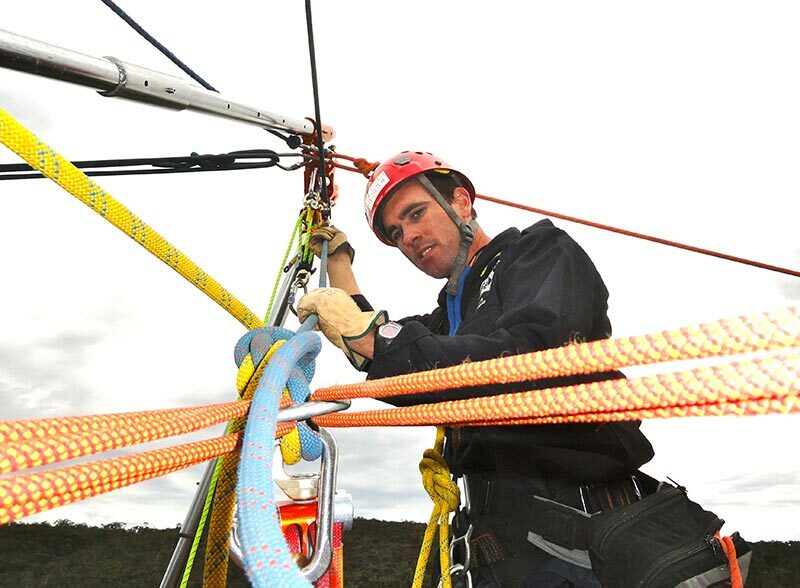 These qualifications have allowed Joel to teach Fire Service personnel, Emergency Response Teams, Rope Rescue Technicians and Instructors throughout Australia and internationally. Joel was indoctrinated into the Ropes That Rescue (RTR) culture by Australian Senior Instructor Len Batley and later mentored by RTR creator and Senior Instructor Reed Thorne. Since 2011 both individuals have educated and influenced Joel’s Rope Rescue career and fuelled his desire to keep testing the boundaries and learn more about the ‘art of clean rigging’. Importantly, the skills that Joel has learnt from RTR equip him with the knowledge to efficiently rig for casualty extraction in time critical operational emergencies. Joel is a devoted family man but when free time allows he is often found with rope in hand as his ‘down time’ is consumed with canyoneering and rock climbing. 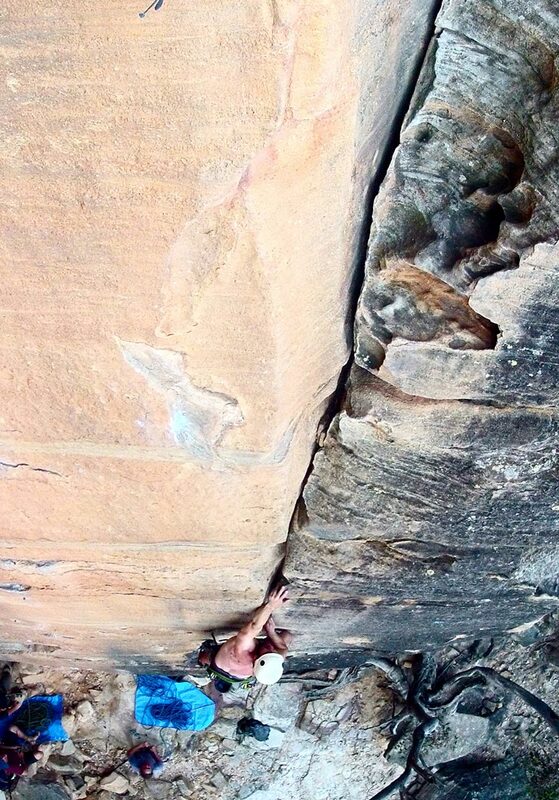 He has travelled throughout Australia climbing many remote multi-pitch traditional routes. His most memorable expedition included hiking for two days to trad climb the highest vertical cliff face in Australia, Tasmania’s Frenchman’s Cap. Joel loves instructing RTR courses and feels privileged and honoured to be part of this highly qualified and motivated team. He believes there is no better way to learn your craft than to teach it to others. Instructing for RTR provides him with an avenue to educate to the ‘highest’ common denominator and meet like-minded rescuers from varied backgrounds. Joel is excited about the next learning opportunity and enjoys sharing his knowledge with fellow rescuers.